The carbonate ion (CO3) has a valency of -2 and forms compounds with sodium (Na), which has a valency of +1, and calcium (Ca), which has a valency of +2. The resulting compounds are sodium carbonate (Na2CO3) and calcium carbonate (CaCO3). The former is known as soda ash or washing soda, and the latter, known as calcite, is a primary component of chalk, limestone and marble. Both are very common compounds. Although calcium carbonate, which comprises 4 percent of the earth's crust, is the winner in this category. Both are white powders with many uses, but they have some key differences. Sodium carbonate has a higher pH than calcium carbonate and is more soluble. It's commonly known as soda ash. Calcium carbonate occurs naturally in chalk, marble and limestone. Calcium carbonate occurs naturally in a number of raw forms, including marble, chalk, limestone and the shells of sea creatures. The primary raw sources of sodium carbonate are trona ore or the mineral nahcolite, a raw form of sodium bicarbonate. Processors heat these materials to derive sodium carbonate. The refinement process is a 7-step one, and the end result is known as synthetic soda ash. Both sodium carbonate and calcium carbonate are basic. In a 10 milli-molar solution, the pH of sodium carbonate is 10.97 while that of calcium carbonate is 9.91. Sodium carbonate is moderately soluble in water and is often used to raise the pH in swimming pool water. Calcium carbonate has very low solubility in pure water, but it will dissolve in water that contains carbon dioxide which has dissolved to form carbonic acid. This propensity to dissolve in rainwater is responsible for the erosion that has shaped limestone cliffs and caves the world over. Industry depends on calcium carbonate and sodium carbonate for a number of uses. Glass manufacturers use sodium carbonate as a flux because when you add it to the silica mixture it lowers the melting point. Around the house, its most common uses are for water softening, swimming pool sanitation and fixing dyes. The main uses for calcium carbonate are in the construction industry, where it is used as a mortar additive and a primary component in drywall and joint compound. Paint manufacturers use it as a paint pigment, and gardeners use it as a fertilizer to raise the pH of soil. You may even have some calcium carbonate in your medicine cabinet, because it's an effective antacid and calcium supplement. Industrial Minerals Association of North America: What is Calcium Carbonate? Industrial Minerals Association of North America: What is Soda Ash? Deziel, Chris. "Difference Between Sodium Carbonate & Calcium Carbonate." 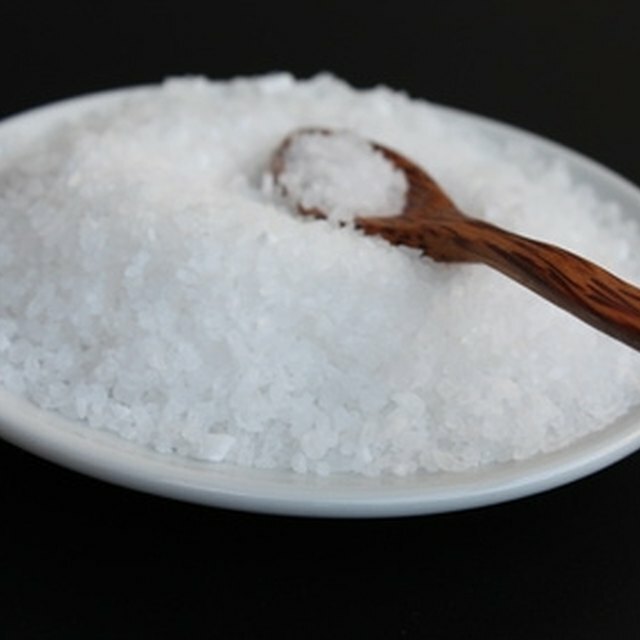 Sciencing, https://sciencing.com/difference-sodium-carbonate-calcium-carbonate-5693285.html. 19 April 2018.